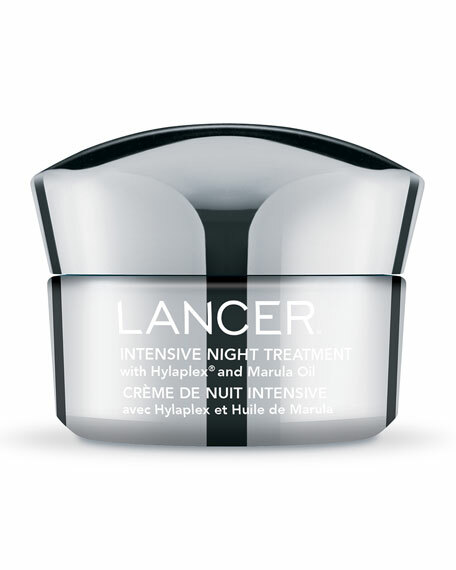 A buttery, moisturizing night cream enriched with nourishing Marula Oil for a deeply hydrated and renewed appearance. Wake up to a smoother, hydrated complexion with Intensive Night Treatment. This luxurious cream melts into the skin, delivering nourishing Marula Oil, rich in essential nutrients, antioxidants and omega 6 and 9 fatty acids while you sleep. Formulated with Hylaplex®, an advanced complex of cross-linked Sodium Hyaluronate and peptides, it draws moisture to skin, plumping the appearance of deep lines and wrinkles. Raspberry Seed Oil, known for its strong antioxidant properties, helps promote a healthy-looking glow and locks in vital hydration overnight. Hyaplex® combines a novel, cross-linked form of Sodium Hyaluronate with peptides and phytocompounds, helping to plump the skin's appearance and provide long-lasting moisture.Marula Oil contains high levels of omega fatty acids 6 and 9 and Vitamin C and E to help improve the look of adverse effects due to sun and environmental damage. Prized for its nourishing properties, it helps to improve the appearance of skin elasticity, firmness and radiance. Apply a small amount to clean,dry skin, sweeping over the face and neck in upward strokes. Use in the evening just before you go to sleep. Water, Caprylic/Capric Triglyceride, Octyldodecanol, Butyrospermum Parkii (Shea) Butter, Glycerin, Pentylene Glycol, Squalane, Cetearyl Alcohol, Sorbitan Stearate, Glyceryl Stearate, PEG-100 Stearate, Tropaeolum Majus Extract, Glycine Soja (Soybean) Extract, Yeast Amino Acids, Orbignya Oleifera Seed Oil, Sclerocarya Birrea Seed Oil, Hexapeptide-48 HCl, Taurine, Trehalose, Urea, Sodium Hyaluronate, Sodium Hyaluronate Crosspolymer, Acrylates/C10-30 Alkyl Acrylate Crosspolymer, Raspberry Seed Oil / Tocopheryl Succinate Aminopropanediol Esters, Polyglyceryl-4 Diisostearate/Polyhydroxystearate/Sebacate, Sodium Isostearate, Ethylhexyl Stearate, Betaine, Inositol, Disodium EDTA, Aminomethyl Propanol, Chlorphenesin, Caprylyl Glycol, Ethylhexylglycerin, Phenoxyethanol, Potassium Sorbate, Fragrance, Citronellol, Geraniol, Hexyl Cinnamal, Limonene, Linalool, Benzyl Salicylate, Benzyl Benzoate, Butylphenyl Methylpropional.